Where Can I Have a Bonfire on the Beach? Everyone loves sitting around a bonfire on a cool summer night and bonfires at the beach are no exception. In fact, bonfires at the beach are even more fun because you get to enjoy the salty, fresh air and relaxing sounds of the ocean. But with ever-changing winds and varying town laws, it can be confusing for visitors to know where exactly they can have a bonfire on the beach. Corolla, Duck, Southern Shores - Beach bonfires are not allowed. Kitty Hawk - Beach bonfires are not allowed. Kill Devil Hills - Beach Bonfires are not allowed. Nags Head - Bonfires are allowed with a permit under certain conditions. Hatteras Island - Bonfires are allowed with a permit under certain conditions. Ocracoke Island - Bonfires are allowed with a permit under certain conditions. Permits: Permits for beach bonfires in Nags Head are issued by the Nags head Fire and Rescue department daily between 5pm and 9pm. Permits are only issued if there are no potential fire hazards and if the wind speeds are no greater than 11.5 mph. Permits are valid through midnight. To get a permit, you will need your driver’s license number and address/location of firepit. Permits cost $10 and can be purchased 3 ways: 1) North Station – Nags Head Fire & Rescue Station 16 (5314 S Croatan Highway MP 14.5), 2) South Station – Nags Head Fire & Rescue Station 21 (8806 S Old Oregon Inlet Rd. MP 18), 3) online via Nags Head Fire & Rescue Beach Permit Website (Permits purchased online have an additional processing fee of $1.00 and the permit is emailed). You can also check the current wind conditions at that site. Permits must be on-site at all times. Fires must be maintained by a competent person aged 14 or older. Pits shouldn’t be larger than 3-feet in diameter. Pits need to be greater than 1 foot deep. Pits should be dug at least 50 feet away from buildings, structures, sea grass, etc. Do not burn trash, lumber scraps or other non-vegetative material. At the end of the night, fires must be completely extinguished with water. Debris should be removed from the bonfire area. Permits: Permits are required for all bonfires on the Cape Hatteras National Seashore (Hatteras Island and Ocracoke Island) and are managed by the National Park Service. From May 1st to November 15th, beach bonfires are only allowed in the following locations: Coquina Beach, Ocracoke Day Use area, and the villages of Rodanthe, Waves, Salvo, Avon, Buxton, Frisco and Hatteras. From November 16th to April 30th, beach bonfires are allowed throughout the entire Cape Hatteras National Seashore park. The in-season limitations are set in order to protect sea turtle nests. Fires are allowed between 6 PM and 10 PM. Permits can be obtained 4 ways: 1) any park visitor center, 2) any ORV permit office, 3) any Cape Hatteras National Seashore campground, 4) print .pdf permit via online NPS Permits Site. Permits are free of charge – simply download and print a copy (or obtain one in person), read, sign, date, and keep it with you during the entirety of your fire. Fires must be maintained by a responsible adult aged 18 or older. Pits should be dug below the high tide mark. Pits should be dug at least 50 feet away from any vegetation. At the end of the night, fires must be completely extinguished and debris should be removed from the bonfire area. Where Should I Start Digging? Most people don’t have the space to pack extra logs in their cars so it’s understandable that you might need to find firewood once you get here. Local shops know this and luckily, firewood is pretty easy to find. Most grocery stores and gas stations sell wood by the bundle (along with other bonfire supplies like matches and ingredients for Smores!) If you need more pieces and happen to have a little space in your vehicle, you may be able to stop along your route to the Outer Banks. If you’re coming in from the North, Currituck Feed and Seed on NC-168 sells firewood (check ahead for availability). If coming in from the West, Tractor Supply Co. in Williamston, NC sells heat-treated USDA certified firewood (check ahead for availability). The short answer is yes! It’s always a good idea to bring flashlights or lanterns when on the beach at night to ensure safety, especially when walking in the sand. During a full moon or a very clear night, you will get a decent amount of light from the stars but unlike in the city, there is VERY little light pollution. You may see the lights in the distance of some hotels or oceanfront homes but this light doesn’t necessarily transmit over the dunes. And when it comes time to go fill a few buckets with ocean water, you’ll appreciate the light assistance. Trust us – it’s dark out there! Luckily, no matter where your Outer Banks Beach Rental is located, you can always hop in the car to get to Nags Head or the Cape Hatteras National Seashore (where several beach accesses allow 4WDs so you can drive your family and fire supplies right out to the beach!). If you’re just heading into the area for a few days, check out our properties that offer Any Day Stays! 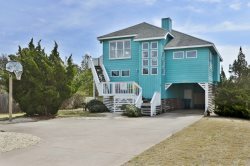 We also offer a variety of Nags Head Vacation Rentals so you can be within walking distance of your next Outer Banks beach bonfire. For a great offer, don't forget to check out our current specials. Sitting around a warm fire with your friends and family while you listen to the crackling wood and the waves crashing on the beach can be a great way to spend a relaxing evening of your vacation. Just remember to clean up any trash, fill in any holes/pits you dig so no one trips, and follow the regulations set by the correct jurisdiction and you’ll make a memory that will last a lifetime! One last tip? Bring a jacket! It gets chilly at night, even in the middle of summer.